Using a third party logistics provider can be an advantageous choice, if the service is reliable. However, any company that finds itself using a bad distribution service can suffer through added stress, a poor reputation, and most unfortunately, loss of clients. What are the consequences of a bad distribution service? 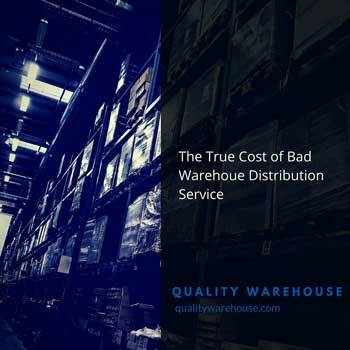 The consequences of a bad warehouse distribution service are pervasive from every angle. It certainly affects your relationship and reputation with clients and customers, but poor distribution can also affect your own internal functions, customer service, and clients’ business functions as well. Any seemingly minor mistake in organization, labeling, or distribution can cause a big backup to fix – so even products that aren’t a part of the mistake can be delayed because of backlogged shipments. Not only will your company be affected by a poorly run distribution service, but your clients will also struggle by not having your products in a timely manner. Picture a paper company with a poorly run distribution service. If deliveries are late, or unorganized, or damaged, how many clients will have to adjust? How many offices, schools, or retail suppliers will be out of stock? And how many unhappy customers will tell their friends, neighbors, and coworkers about their experience? Inefficient and unreliable delivery is not only inconvenient for your customers, but it can have a big effect on their lives and business practices as well. Because unreliable distribution services reflect poorly on your business, it takes active work from your team to fix your brand’s relationship with unhappy clients. Your customer service team will need to keep track of the complaints from customers, and it takes time and money to make these clients happy. This requires even more work to mend your public image and your private relationships with customers who may have been affected by a warehouse mistake. Poor warehouse services won’t only affect your relationship with clients who are affected by a mistake. Ultimately, poor distribution reflects on your own company, no matter how much control you have over deliveries or how stellar your product is. If your distribution service is unreliable, then your business looks unreliable to clients. This can lead to a massive loss of clients and money, threatening your business practices. Not to mention that customers’ experiences with your brand can shape the future of your business. Now, with the Internet capabilities of online reviews and self-publishing, news is easy to access – and angry backlash to bad experiences spread faster and farther than even the best reviews. One small mistake can lead to a big, expensive, and detrimental ordeal for your business. You definitely want to make sure mistakes are unlikely, and that means choosing a good, reliable warehouse distribution service. Disorganization. A poorly run system of organization can cause problems in delivery and can also lead to backups that can take weeks to sort out. Make sure to ask about their system of labeling, organizing, and managing products for delivery when searching for a warehouse service to partner with. Poor customer service. If your distribution service doesn’t communicate well with you, you’ll have less control over your own products’ movement and management – not to mention you may not know what’s going on! Poor external communication can also be a sign that internal communication is problematic – which is a warning sign about how the company functions in itself. The way your warehouse distribution service functions can have a big impact on your own company – positively or negatively. Make sure to consider organization and communication as major factors in your search for a good public warehouse.